Silver work may be either ecclesiastical or secular, depending on its use. 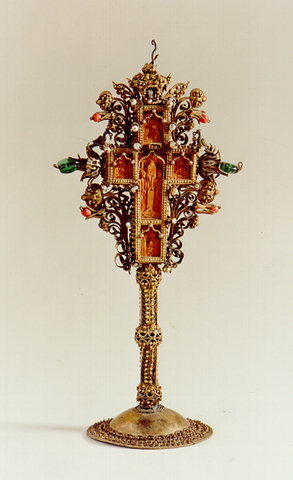 Ecclesiastical objects include patens, chalices, crosses, hexapteriga, reliquaries and the Gospels. Among the secular objects are various silver household utensils (mugs, salvers), men's uniform accessories (weapons, bandoliers, portable inkwells) and men's and women's dress ornaments. The chief material used was silver, either pure or alloyed. The most usual techniques were engraving, casting, filigree, and embossing, as well as enamelling and "savati" (black enamel). Silversmiths' workshops flourished in the villages of Syrrako and Kalarytes (Pindos), at Yiannina, Stemnitsa in the Peloponnese and Saframpoli in Asia Minor.